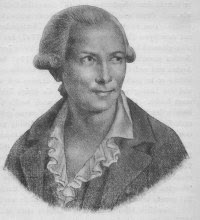 The career of the musician and virtuoso chessmaster François-André Danican Philidor is interesting both in itself and for the light it shines on 18th-century society, its systems of patronage and modes of sociability, and the opportunities it afforded to an exceptional gifted individual. In all weathers, wet or fine, it is my practice to go toward five o'clock in the evening to take a turn in the Palais Royal.... If the weather is too cold or too wet I take shelter in the Regency coffee house. There I amuse myself by looking on while they play chess. Nowhere in the world do they play chess as skillfully as in Paris and nowhere in Paris as they do at this coffee house; 'tis here you see Légal the profound, Philidor the subtle, Mayot the solid; here you see the most astounding moves, and listen to the sorriest talk, for if a man be at once a wit and a great chess player, like Légal, he may also be a great chess player and a sad simpleton, like Foubert and Mayot. In the early eighteenth century chess became a fashionable diversion among more cerebral members of the French and English leisured élite. The exact steps are not easy to chart, but appreciation of the game was undoubtedly fuelled by the work of the early 17th-century Italian master Gioachino Greco, whose pioneering illustrated chess manual went through many 18th-century editions. 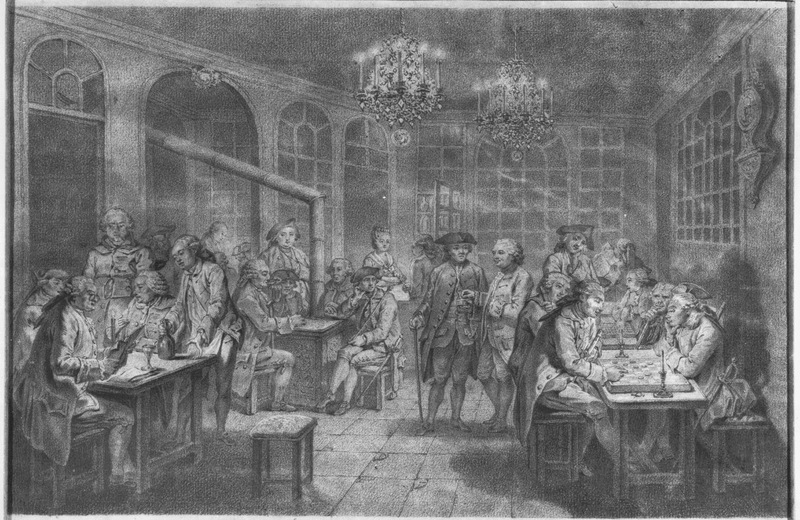 In London and Paris chess became a feature of the new coffee-house society. In Paris around 1740 the most ambitious players began to gather at the Café de la Régence in the rue Saint-Honoré. Chessboards were rented by the hour, with a higher fee payable at night when candles were provided. 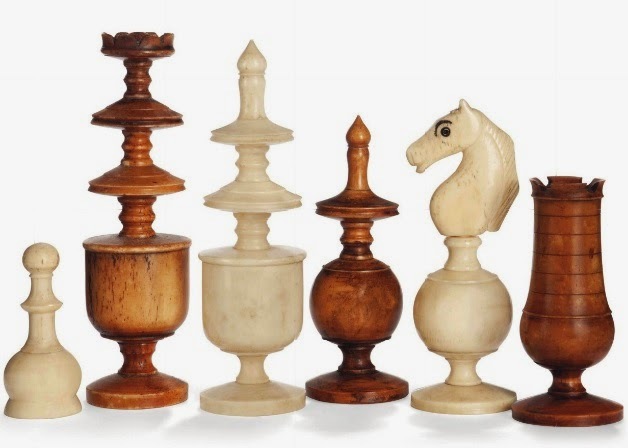 In the 1780s, the height of the chess vogue, a dozen tables were in constant use. Interest was encouraged by the presence of François-Antoine Legall de Kemeur (1702–92), a talented player and instructor, “a thin, pale old gentleman who sat in the same seat at the café, and wore the same green coat, for a number of years”. Legall is often identified as the first "professional" chess player; the proprietor of the Régence put him on the payroll. Chess was normally played for stakes at the Régence; a formalised system of ranks and odds existed among Parisian players; it was usual to concede pieces or moves to weaker opponents in order to create more competitive matches. Only Legall and later Philidor were “first rank” players, five others were “second rank” and there were third, fourth and fifth ranks besides. Diderot mentions a couple of names - Foubert and Mayot - and lists of Legall's matches yield a few more - but otherwise these players are unknown. François-André Danican Philidor, the acknowledged master of his age, always regarded music as his first vocation and earned renown as a composer of church music and comic operas - Baroque compositions nowadays only dusted down occasionally by aficionados. He came from a family of court musicians - the name "Philidor" was proudly handed down by his grandfather (possibly great grandfather) an oboe player from Dauphiné who had once been compared by Louis XIII to the renowned Italian player Filidori. Our Philidor was born in September 1726 and began his music education as a page of the Royal Chapel at Versailles. Even as a child he was composing well-regarded motets. His chess prowess was the fruit of long hours wiled away in the antechamber of the Chapel where a long table, inlaid with six Chess-boards, was provided for the diversion of the pages who attended the daily royal mass. The obligatory stories of Philidor's precocious talent were relayed by his son - who knows, perhaps they were true. At the tender age of fourteen, his musical education complete, Philidor was forced to support himself by teaching and copying music. It was at this time that he began to study chess seriously under the tutelage of Legall; at first he accepted the rook from him; it took him three years to work his way up through the odds to the honour of confronting his master on even terms as "first rate". He was to finally beat his master in an exhibition match in 1754. We have had at Paris a young man aged eighteen, who used to play two games of chess at once without looking at the boards, beating two players of better than average ability, to each of whom he could only give odds of a knight when playing with sight of the board, although he himself was a player of the first rank. To this feat may be added something that we witnessed with our own eyes: In the middle of one of these matches, an illegal move was deliberately made; after a rather large number of subsequent moves, he recognized the error and had the piece put back where it belonged. This young man is a M. Philidor; he is the son of a musician of some renown; he is himself a great musician, and perhaps the best player of Polish checkers there ever was or ever will be. This is one of the most extraordinary examples of the power of memory and imagination. Phillip Stamma "of Aleppo", a Syrian-born player who was in London in the employment of the British government as a translator of Oriental dispatches, and whose books tantalised Europe with promises of unearthing ancient chess secrets from the Islamic world; Stamma was trounced by eight games to one, with one draw. Holland, Prussia and the "Analysis of Chess"
Philidor now returned to the Continent, where peace negotiations were underway at Aix-la-Chapelle. His intention was to secure subscribers for his new chess manual, the Analyse des échecs which was published in London in 1749. He evidently met with some success, for the first edition boasted 127 subscribers, including Lord Sandwich and the Duke of Cumberland, who put his name down for 50 copies. The book, which set forth Philidor's famous intuition that "pawns are the soul of the game", was an instant best-seller and was rapidly translated into English and German. Back in London, Philidor began to move in illustrious circles, frequenting the house of the French ambassador, the duc de Mirepoix, an enthusiastic player who gave weekly Chess dinners. In 1751 he set off on his travels again, this time to try his fortune in Berlin. A letter of the mathematician Euler testifies to Prussian enthusiasm; he himself wished to play Philidor but the prodigy was seldom in Berlin itself, being detained at Potsdam. Frederick the Great, did not play him either, but he was a spectator at several matches. It is known that these included exhibitions of blindfold chess, including winning three games simultaneously. Philidor also took the opportunity to extend his musical studies. In 1752, he stayed with the Prince of Waldeck at Arolsen and at the Court of the Landgrave of Hesse-Cassel before returning to England. David Shenk, The Immortal game: a history of chess (2008) Chapter 5.